Usefull and comfortable. From 5 months onwards. DescriptionMake meals comfortable and safe while on holidays with baby in Paris or anywhere in France. 3-position recline of which one baby lounger. Large, rounded basis for better stability. 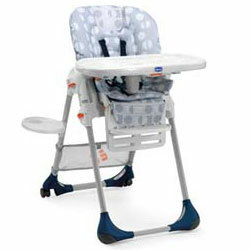 High chair rental will allow you to have baby comfortably installed for his meals or for playtime. This high chair is particularly complete (but slighty cumbersome). Its several positions will make possible to use it from 5 months onwards (recline, high or low position).You'll be able to use it with the tray for the youngest one, or directly at table with the whole family for the older children (the several height adjustement possibilities will allow you to adjust it to the family table height). Baby'tems was extremely easy to work with and so helpful! They actually came and delivered the items to my mother, before my arrival, and even agreed to come in the very early morning to collect the items so that I could "check out" on time. They were very flexible, the items were in perfect condition, and Baby'tems kept us informed of all steps of the process, including an email indicating that the items were retrieved in good condition. We received our deposit reimbursement very quickly, and were overall very happy with the service Baby'tems provided. We will recommend you to all of our friends! !